In the Assembla app, you can use tickets to manage tasks your team is working on. Tickets are used for tasks that need to be completed, like an issue report or a feature request. A ticket can be an Epic, Story, Subtask or a bug report. You create tickets within your project space so you can have dozens of tickets associated with one project. 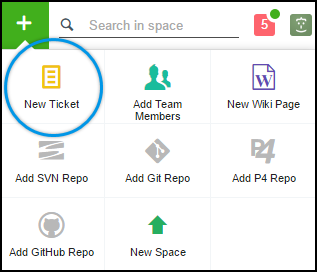 You can assign tickets to team members in your project space, follow tickets, and mention team members in a ticket’s description or comments. Team members associated with a ticket will be updated as progress is made toward completing the task. For more information about working with team members, see our Help Center section on Managing Your Team. This article is an introduction to working with tickets in the Assembla app. It covers how to create tickets and how to use the subtabs in the tickets interface. It doesn't discuss every available feature - just enough to get you started. Let's start by creating a new ticket. After entering the project space you want to work in, move your cursor to the green plus menu on the upper right of the page and select New Ticket to open the ticket page. Enter a short description of the task in the summary field. The summary will be displayed in the ticket list and cardwall views. Think of the summary like the Ticket's title. Below the summary is an optional field where you can enter a more detailed description of the task and its requirements. You can mention a team member in the description by entering the @ symbol followed by their username, like “@demouser”. If that team member has mention notifications enabled in their account settings, they’ll get an email about the ticket. If you want to attach a file to the ticket, drag the file to the description field. You can click the link at the bottom of the description field to browse to the file on your computer, or use our Filestack upload tool to add the file from dozens of services like Flickr, Google Drive, Dropbox and more. On the left side of the page is the ticket sidebar, which lists several ticket properties. Several fields will have default values filled in for you. Status: The status represents the ticket's state in your workflow. Tickets usually start as New, then advance to other states as work is completed. These statuses are customizable. For more information, see Using the Assembla Cardwall. 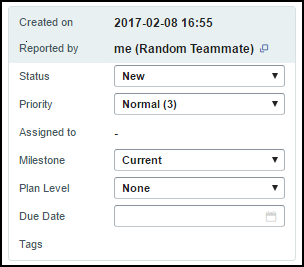 Assigned To: Click the field for the Assigned to property to assign responsibility for the ticket to a member of your team. Milestone: The milestone the task applies to. Milestones represent broad project goals like software version releases. We discuss milestones in more detail in the Milestone section later in this article. Tags: Click the tags field to select or enter tags to apply to the ticket, then click Submit in the tags interface. You can add more properties to tickets by editing the ticket fields in the project space settings. For more information, see Add Customized Ticket Fields. When you’ve filled in the necessary information, click Submit below the description field to create the ticket. You can always come back to edit tickets. After the ticket has been created, click the List subtab to see it in the Ticket List. The List subtab displays the tickets your team is working on. The list will show each ticket's summary, who it assigned to, and what the status is. A red star next to a ticket indicates that it's assigned to you, while a gold star means that you're following the ticket. Click a gold or gray star to toggle whether you're following the ticket. You'll get emails notifying you when changes are made to tickets you follow. You can use the Filters menu to the upper right of the ticket list to filter the view using conditions like priorities and tags. Clicking a ticket in the list will let you view the ticket's details, edit the ticket, or add a comment that team members can read and respond to. Next, click the Cardwall subtab to see another way you can view your project's tickets. The Cardwall subtab displays tickets as cards, with each column corresponding to status. 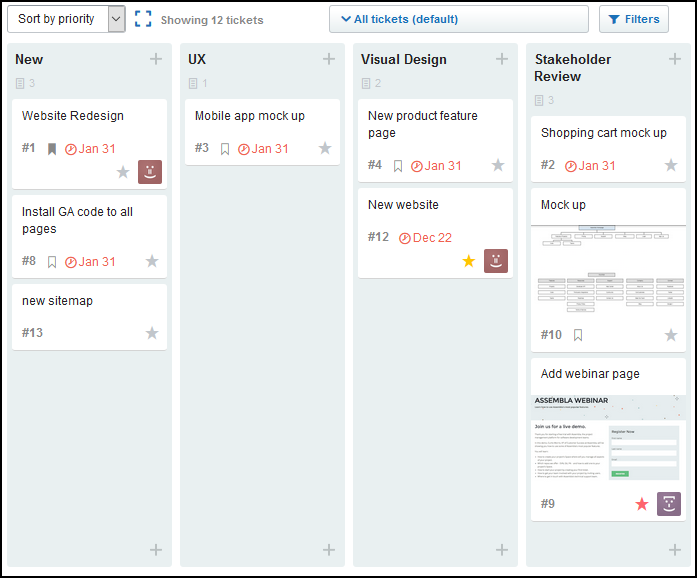 The cardwall can help you visualize your project's progress and see what work remains to be done. You can quickly change a ticket's status by dragging it to another column. Clicking a card lets you see ticket details and make other changes. You can filter the tickets displayed using the filters menu in the upper right. Now click the Milestones subtab. Milestones can be used to organize your tickets according to broad project goals. A software development project might have milestones for its next minor and major versions, for example. The Milestones interface displays each milestone's progress and due date. You can create a new milestone with the Add Milestone button in the upper right. Click the gear menu to the right of a milestone to call up reports for that milestone, view its tickets in the cardwall or mark the milestone as completed. For more information on milestones, see Organize tickets using Milestones. Finally, let's look at the settings subtab. It's a good idea to look through each section and tailor the settings to suit your project's needs. Now that you understand the basics of working with Assembla tickets, you can set up your project and assign tasks to team members. For more information on working with tickets, please visit the Tickets section of the Assembla Help Center. Need help? Email us at support@assembla.com with questions.